Before you purchase a pet duck, understand that this feathered friend is not suited for the indoors or for a solitary life. Though an unused garage may serve, a coop or outdoor housing is ideal for a duck's needs, not to mention it will prevent duck messes in your home. Make sure that you are able to give the duck all aspects of a safe and happy habitat, including at least one other duck friend. 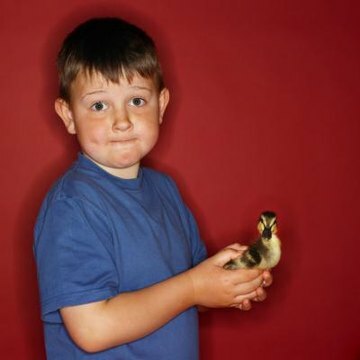 Ducklings must be kept in a brooder for the first two to three weeks of life. This is the only time where they can be indoors. The brooder is made simply from a large cardboard box or plastic tub and a heat lamp. The temperature needs to be kept at 85 degrees Fahrenheit during the ducklings' first week, and decreased by 5 degrees per week until it reaches 70 degrees, when the ducklings can be moved outside under similar conditions. The coop is a simple structure but must have a minimum floor space of two to three square feet per duck to allow them to move around comfortably. This does not take into account the one square foot necessary for nest boxes, where your female ducks will lay eggs. The floor must be solid and not made of wire, which can hurt the smooth, sensitive skin of the ducks' feet. Certain specifics to the coop's design depend on your area's weather patterns. Ventilation is needed for hot climates, insulated walls for freezing weather and a water-tight roof for rain. The shelter must be locked up at night to protect your ducks from predators unless certain precautions are taken with a fenced area around the structure. The fence will need to be buried about a foot underground to prevent predators from digging under. A fenced roof not only thwarts flying predators, but keeps ducks from flying south for the winter. Where you place the coop is just as important as its construction. Look into state and local laws that may require it to be a certain distance from neighboring properties. The shelter needs to be in a shaded area to protect your ducks from the sun as they cannot tolerate it after eating. Placement near your home or a similar building will provide a windbreak. Consider also where there is higher ground rather than low, flood-prone areas. Integral to the habitat are the additional components that go inside of the shelter, which can be purchased a farm supply stores. Shavings, straw or a dry, absorbent material is used as litter and must be cleaned often. Similar to the brooder's heat lamp, a light inside of the coop keeps it warm and supplements daylight during shorter, darker days. Keep feeders and waterers a few inches off the ground, provided the ducks are able to reach it and dip their bills completely in the water. Grit is obtained by ducks from tiny pebbles outside to help grind up food as they do not have teeth. If they do not have outdoor access, you need to provide this in the form of sand or bird gravel in a small bowl next to the feeder. If the duck is allowed outdoors, supplementary grit is not necessary. Though it is not necessary for the ducks' health, clean swimming water is certainly fun for a duck. Provide a pond or even a small kiddie pool as long as the ducks can easily enter and exit. Never leave them unsupervised in the swimming water. As social creatures, ducks can become lonely by themselves so it is best to purchase at least two ducks. Keep only females if you do not intend to breed them or only one drake, or male duck, for every five females.